El segundo DVD de la cuarta temporada narra las aventuras rigurosas y románticas en Canadain Frontier. Inspirado por los libros de Janette Oke y producido por Michael Landon Jr.
Desde la célebre autora Janette Oke (serie The Love Comes Softly) llega una aventura rigurosa y romántica tan épica como la gran frontera. 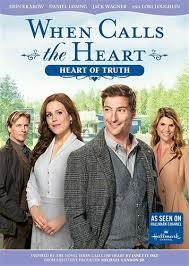 Erin Krakow (esposas del ejército), Daniel Lissing (Eye Candy), Jack Wagner (Melrose Place) y Lori Loughlin (Full House, 90210) protagonizan When Calls the Heart: Heart of Truth. Ray Wyatt, del Ferrocarril Nacional del Pacífico, llega a la ciudad y le dice a Abigail que quiere traer el ferrocarril al Valle de la Esperanza. Mientras Elizabeth y Jack entrenan a los niños en el béisbol, Elizabeth se esfuerza por ayudar a un niño a reconciliarse con una vieja lesión. El Superintendente Collins se va de Hope Valley y le ofrece un nuevo trabajo a Jack en los Territorios del Norte. En la escuela, Elizabeth intenta que Robert diga la verdad sobre un oso. Bill descubre que Robert se va de la ciudad, y finalmente le da a Robert el empujón que necesita para decir la verdad. EN INGLES: When Calls the Heart: Heart of Truth (2017); The second DVD of the fourth season telling the rigorous and romantic adventures in the Canadain Frontier. Inspired by the books by Janette Oke and produced by Michael Landon Jr.
From celebrated author Janette Oke (The Love Comes Softly series) comes a rigorous and romantic adventure as epic as the wide frontier. Erin Krakow (Army Wives), Daniel Lissing (Eye Candy), Jack Wagner (Melrose Place) and Lori Loughlin (Full House, 90210) star in When Calls The Heart: Heart of Truth. Ray Wyatt, of the National Pacific Railroad, comes to town and tells Abigail that he wants to bring the railroad to Hope Valley. As Elizabeth and Jack coach the kids in baseball, Elizabeth struggles to help a young boy come to terms with an old injury. Superintendent Collins is leaving Hope Valley and offers a new job to Jack in the Northern Territories. At school, Elizabeth tries to get Robert to tell the truth about a bear. Bill catches Robert leaving town, and finally gives Robert the push he needs to tell the truth.